MTSU in China: Agreement signe..
MTSU students make major impac..
A wealth of previously undiscovered creativity from the pen of one of America’s most original musicians will come to light this summer with help from MTSU. 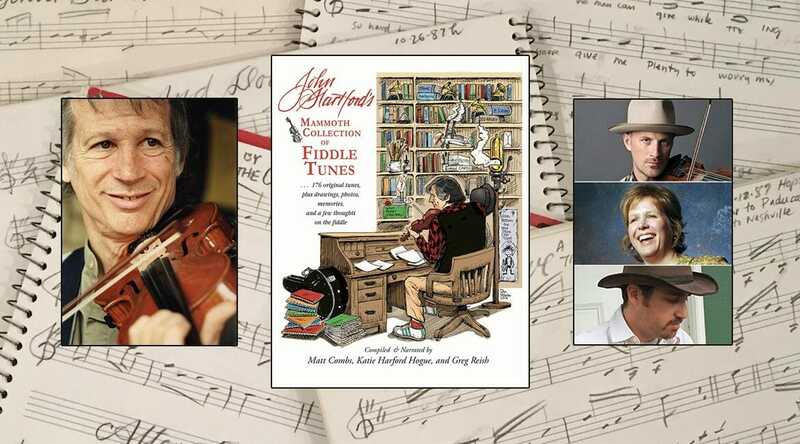 “John Hartford’s Mammoth Collection of Fiddle Tunes” will make its debut at the John Hartford Memorial Festival May 31-June 2 at Bill Monroe Music Park in Beanblossom, Indiana. The book will be available at bookstores starting Monday, June 4. Dr. Greg Reish, musician, musicologist and director of MTSU’s Center for Popular Music, compiled materials and wrote the text for the book with Hartford’s daughter, Katie Hartford Hogue, and Matt Combs, former member of the John Hartford String Band. The book contains 176 of Hartford’s original fiddle tunes and more than 60 of his drawings and photos previously seen only by family members. You can hear Reish and Combs play “Go Home to Your Mother,” one of Hartford’s original fiddle tunes included in the new collection, in the video below. Reish and his co-authors worked on the book for more than a year and a half, and Reish interviewed Hartford’s family, friends and fellow musicians, including luminaries such as Marty Stuart and Bela Fleck. As part of the “Newgrass” movement of the 1970s, Hartford’s authenticity gained currency with the counterculture generation that yearned for something genuine in their music. The project isn’t the first connecting Hartford with MTSU’s Center for Popular Music. In January 2016, the center’s Grammy-winning documentary label, Spring Fed Records, released “Home Made Sugar and a Puncheon Floor,” a set of home recordings made by Hartford and fiddling legend Howdy Forrester, to great acclaim. In that collection of 20 previously unreleased traditional tunes, Hartford plays banjo, Forrester fiddles, and the two share informal discussion about the songs and their sources on the record. You can learn more about it here. Forrester, the longtime fiddler in Roy Acuff’s band, was one of the most well-known traditional musicians that Hartford visited throughout his career, always recording their conversations and jam sessions. The Center for Popular Music at MTSU, a part of the College of Media and Entertainment, is one of the nation’s largest and richest repositories of research materials related to American vernacular music. To contact the MTSU Center for Popular Music, call 615-898-2449, send an email to popular.music@mtsu.edu or visit www.mtsu.edu/popmusic. For more information about the book or John Hartford’s legacy, go to www.johnhartford.com. To learn more about the John Hartford Memorial Festival, visit www.johnhartfordmemfest.com.